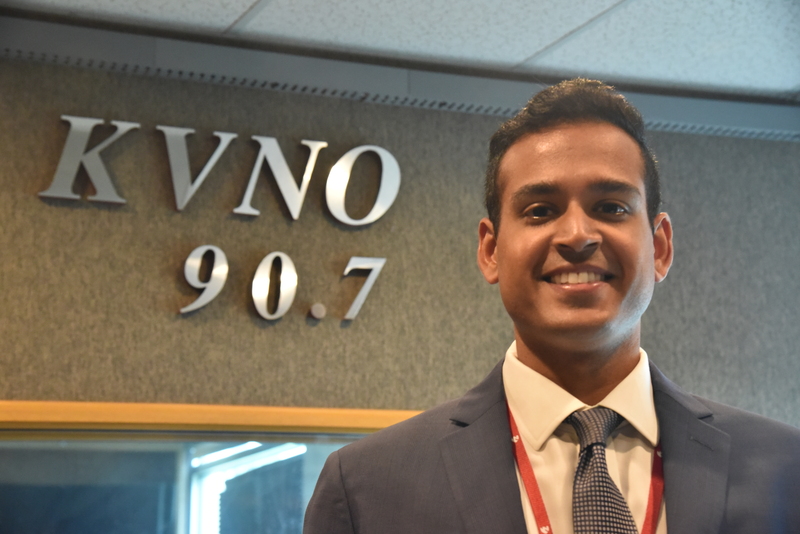 Time now for Friday Faculty Focus with KVNO’s Brandon McDermott speaks with Dr. Zafar Sayed from the College of Medicine’s Department of Otolaryngology at the University of Nebraska Medical Center. Brandon McDermott: Dr. Zafar Sayed, thanks for coming on the show. Dr. Zafar Sayed: It’s a pleasure. McDermott: You practice in head and neck surgical oncology, treating a variety of head and neck malignancies. Can you kind of explain your work for us? Dr. Sayed: That’s correct. As a surgical oncologist we typically are the surgeons involved with any cancer in that region of the body. Obviously there are many parts of the head neck, but most of the time this involves cancers in the oral cavity. So, for example the tongue, the lips, parts of the throat which we call the pharynx, the voice box which medically is known as the larynx and we also do a variety of procedures such as thyroid surgery and we will operate on tumors of the salivary glands as well. McDermott: You studied advance head and neck surgical oncology at Memorial Sloan Kettering Cancer Center in New York City. How to help prepare you for the fire so to speak? Dr. Sayed: That year was really a life changing year — it is really a world class institution. Sloan Kettering is one of the premier cancer centers I think in the world. We certainly would see a fair number of patients from all over the country, as well as a lot of international patients who come to the cancer center for their premier care. Clinicians who work there are focused on cancer 100 percent — similar to the Fred and Pamela Buffet Cancer Center it is a free standing structure that only deals in cancer. Because of that, you have a lot of expertise, both clinically and in the research realm, to get a chance to deal with that level of experience during your training is I think just an honor and a privilege – I had a wonderful time. McDermott: You’ve got a couple journal articles which are currently under review — that you’re either a part of or that you’re a sole author of — can you kind of talk about those? Dr. Sayed: Some of my recent work has looked at sinonasal cancers specifically it is he’s called mucosal melanoma. Looking at our Memorial Sloan Kettering database, we were able to go back and accrue patient data from back in from the 1990s — this is a relatively rare cancer — so we able to collect about 75 or so patients in the study. We really looked at our surgical outcomes, seeing how these patients did after endoscopic resection and after more aggressive what we call open resection where we take out large parts of the bony confines of the sinus cavity. We wanted to know how these patients do and were there potentially less aggressive treatment options that we could offer the subset. So, although it’s a very rare disease given that Sloan Kettering sees a number of rare cases we were able to accrue enough patients that it was clinically meaningful. McDermott: Is there any new advance or new advances in head and neck oncology? Dr. Sayed: There are a couple new talking points that have been discussed recently one is the whole concept of personalized medicine and targeted therapy, whereby a lot of head neck tumors are now being analyzed on a genetic level and we’re seeing what are the specific mutations that are crossing these cancer types in these disease types. That is allowing a lot of medical oncologists and researchers to try to focus certain therapies on those specific genetic mutations. There’s also been a new thrust looking at thyroid cancer specifically what we call well differentiated thyroid cancers and the fact that many of them may now be as aggressive as we previously thought and some of them may not even require traditional surgery, so some of these incidental small thyroid cancers that we’re finding that are relatively low risk may be candidates for observation alone. This is somewhat controversial work that is being looked at but there’s data specifically from Japan as well as some Memorial Sloan Kettering data which is starting to look at this a little bit more in depth. McDermott: We spoke on a lot of topics here — your work in head next surgical oncology, new advances there, your work in some of the journal articles you’re putting together — but is there anything else you’d like to add before we go? Dr. Sayed: I’d just want to point out that head and cancer is somewhat unique in that it really effects a lot of the senses that we take for granted — it’s part of what it means to be human and as far as being able to see, being able to eat, being able to taste, being able to smell, being able to hear and all and all those senses can be really grossly affected after cancer resection and cancer surgery. So a big part of what we think about during treatment, is actually restoring function and that is not always the case in a lot of other specialties, so we really do think about getting the patient as close to their baseline as we can when we think about also treating their tumor. It’s sort of a difficult balance sometimes but that’s one of the challenges that makes this field really unique and really fun to be quite honest. McDermott: Dr. Zafar Sayed, thanks again for coming on the show. Dr. Sayed: Thanks for having me, I appreciate it.